In the closing days of the midterm campaign, President Trump promised to make it no longer possible for children whose parents are not citizens of the United States to be citizens themselves just because they were born here. “We’re the only country in the world where a person comes in, has a baby, and the baby is essentially a citizen of the United States for 85 years with all of those benefits,” he said in an interview. The president has yet to issue an executive order to end what is generally known as birthright citizenship, and even if he did, Congressional action could be required. Ending birthright citizenship, which is rooted in the 14th Amendment, is only one of the ways that the president has focused anti-immigrant fervor on Mexicans and Central Americans. He has accused people he says are not legal residents of improperly working in the United States, unfairly reaping the benefits of taxpayer-supported aid, and terrorizing defenseless communities. He also has accused them of voting in U.S. elections, one of the most meaningful rights of citizenship. Donald J. Trump’s successful campaign for the White House began with a relentless refusal to recognize the citizenship of a twice-elected U.S. president certifiably born in the United States to a native U.S. mother and an African father legally residing on U.S. soil. Trump is halfway through his term. “The U.S. has become a dumping ground for everybody else’s problems. And these are[n’t] the best and the finest. When Mexico sends its people, they’re not sending their best…They’re sending people that have lots of problems, and they’re bringing their problems with us [sic]. “They’re bringing drugs. They’re bringing crime. They’re rapists. And some, I assume are good people. But I speak to border guards, and they tell us what we’re getting. And it only makes common sense. It only makes common sense. They’re sending us not the right people. Here are some of the particular ways President Trump has advocated changes in policy, laws and law enforcement regarding immigration and citizenship to achieve those ends, and what has happened. President Trump was barely in office before Mexico’s then president, Enrique Peña Nieto, emphatically told him that Mexico would not pay for any such wall. The president has been trying ever since to get the money from Congress. He has been shown various examples of what the wall might look like, and some funds have been spent to upgrade existing physical barriers and electronic monitors along the southwestern border, which is about 2,000 miles long. Meanwhile, the cost has gone from the administration’s initial estimate of $21.6 billion to nearly $70 billion forecast by Democrats in the House. Trump seeks $5 billion for a border wall. In December, the president made good on his threat to partially shut down the federal government if Congress did not approve $5 billion for construction of the wall as part of the 2019 budget. The 35-day shutdown—the longest in history–ended Jan. 25 when Trump relented. However, the agreement reached only temporarily reopened shuttered government agencies through Feb. 15. Lawmakers continue to negotiate a deal to fund the remainder of the fiscal year. Democrats, who took control of the House in January, offered additional funding for border security but refused to pay for a wall. Trump has threatened to declare a national emergency and begin work on the wall without congressional approval if the current negotiations fail to provide the $5 billion. “We have the hottest economy in the world, and the jobs and the unemployment—you look at any numbers right now; we have more people working than at any time in the history of our country. “And people want to come in and in some cases they want to take advantage of that, and that’s okay, and we want them to come in. But they have to come in through merit, and they have to come in legally. Asylum is an established legal process for becoming a resident of the United States with a path to citizenship. Every year, the United States grants asylum to some 30,000 persons. In the most recent years, the fastest growing group among those persons is people from El Salvador, Guatemala and Honduras—the so-called Northern Triangle of Central America on Mexico’s southern tip. 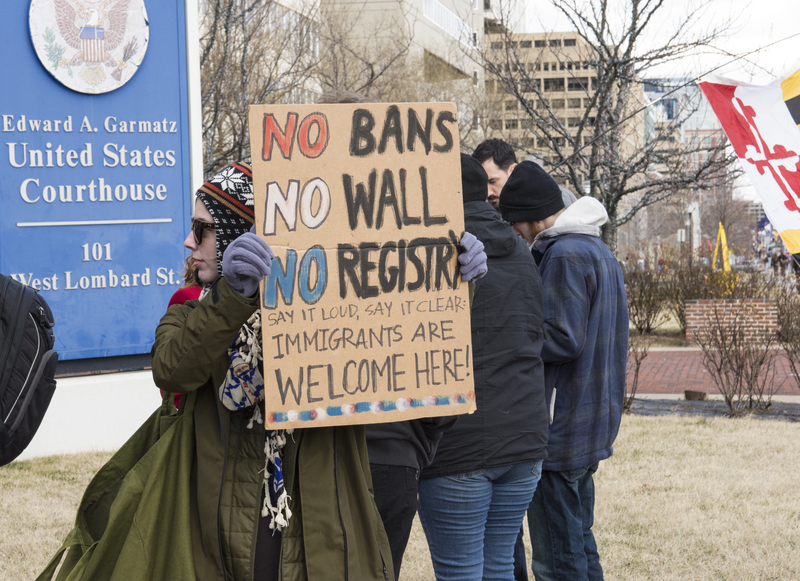 Under international principles and U.S law, asylum seekers must be in the country to begin the application process, and it doesn’t matter whether they have entered the country legally or illegally. The increased numbers of would-be asylum seekers from Central America often have flooded official ports of entry along the border. In order to avoid waits that can last for days or weeks, many, including large numbers of women and children, have simply crossed the border at other points and promptly surrendered to U.S. border enforcement officials. Three days after the Nov. 6 midterm elections, President Trump citied national security concerns and issued a proclamation that the United States no longer would accept asylum requests from persons who did not cross the border at an official entry point. Advocacy groups filed suit, contending that the president’s action effectively banned asylum. In late December, administration officials announced that they had negotiated a plan for asylum seekers to remain on the Mexican side of the border until their individual applications could be processed. There seemed to be some dispute about whether Mexican President Andrés Manuel López Obrador, who was sworn in Dec. 1, had actually agreed to the plan, how it would be implemented and whether it complies with U.S. law and international principles. “The fourth and final pillar [of the immigration reform plan] protects the nuclear family by ending chain migration. Under the current broken system, a single immigrant can bring in virtually unlimited numbers of distant relatives. Under our plan, we focus on the immediate family by limiting sponsorships to spouses and minor children. This vital reform is necessary, not just for our economy but for our security and our future. Current U.S. immigration policy gives legal permanent residents who are not citizens the same opportunity as native-born and naturalized citizens to sponsor their spouses and unmarried children for permanent residency. Once the relative is vetted and approved for residency, there is a waiting list, and it can be months or years before the relative can actually apply for the card. The New York Times reported at the beginning of 2018 that those authorized to apply for cards at that time would have had to have been on the waiting list for 13 years, and even longer in some instances. President Trump had said that the Uzbekistan national charged in the 2017 terrorist attack in New York City that killed eight people had used chain migration to bring 22 people into the United States. “There’s no evidence of that, and it’s likely not even possible,” FactCheck.org reported. The alleged shooter in the New York City incident actually had entered the United States through the Diversity Visa Lottery, which authorizes about 50,000 green cards each year. The program is designed to grant legal residency to persons from nations that send relatively few immigrants to the United States in previous years. Most have come from Africa and the Caribbean. The four-part immigration initiative that President Trump proposed in the 2018 State of the Union address included ending the diversity lottery, along with building the wall, ending chain migration and creating a path to citizenship for 1.8 million undocumented immigrants. Both Republicans and Democrats in Congress rejected the proposal. The president’s statements on immigration have often included or featured references to MS-13, a gang with some roots in U.S. prisons but now centered in El Salvador. He frequently has suggested that Central Americans entering the United States include MS-13 members. Most members of the gang, however, were born to parents or grandparents already in the United States, and have never been to the home countries of their families. Most MS-13 members in El Salvador have never been to the United States, either, according to a 2017 study by researchers at Florida International University. President Obama launched the Deferred Action for Childhood Arrivals (DACA) program in 2012 as a way to permit persons brought to the United States illegally as children to remain in the United States without fear of deportation. Some 800,000 young adults had registered under the program by late 2017. A federal judge in San Francisco supported a legal challenge to the administration’s rationale for ending the program—that Obama had abused executive authority when he enacted the policy—and ordered that DACA be revived until the legal challenge could be resolved. The 14th Amendment to the Constitution, adopted in 1868, granted citizenship to “all persons born or naturalized in the United States.” It decreed that citizenship was a privilege of neither race nor religion, but a right based on the land on which persons were born. Eleven years earlier, in a Supreme Court decision in the case of Dred Scott v. Sandford, citizenship had been denied to Africans whose forbearers had come to the United States as slaves because they had not been mentioned specifically in the Constitution. Candidate Trump referred to birthright citizens as “anchor babies” and described the process with a south-of-the border example. “What happens is they’re in Mexico, they’re going to have a baby, they move over here for a couple of days, they have the baby,” he told Bill O’Reilly of Fox News. Others have referred to the practice of foreigners utilizing birthright citizenship as “birth tourism.” By one estimate, for example, 60,000 children were born to women who were Chinese citizens in 2014, six times as many as two years earlier. Most came to the United States on tourist visas from wealthy families and hoped to avoid high levels of environmental pollution in China linked to lower birth rates that put babies at risk in their first month and later in life, according to one study. They returned to China after their children were born here. “Foremost in many Chinese parents’ minds are the educational opportunities available in the U.S.,” from kindergarten to doctoral studies that are “cheaper and more accessible” with a U.S. passport, The Huffington Post reported. President Trump’s announcement that he would issue an executive order to abolish birthright citizenship came on Oct. 30. Three months later, he still had not issued any such order. The Russia report released April 18 contradicts President Donald Trump's claims that special counsel Robert Mueller had two conflicts of interest that prevented him from conducting an impartial investigation. The post Debunking Mueller’s ‘Conflicts’ appeared first on FactCheck.org. A popular meme takes aim at prominent lawmakers by referencing the number of bills they've had passed. But it uses an erroneous number -- and omits context. The post A Misleading Claim About Lawmakers’ Effectiveness appeared first on FactCheck.org. In the hours after the public release of the redacted report from special counsel Robert S. Mueller, President Donald Trump took to Twitter with a message that reads, in part, "NO OBSTRUCTION!" That's not at all what the Mueller report says, though. The post What the Mueller Report Says About Obstruction appeared first on FactCheck.org. The special counsel investigation "established multiple links between Trump Campaign officials and individuals tied to the Russian government." But it "did not establish that the Campaign coordinated or conspired with the Russian government in its election-interference activities.” The post What the Mueller Report Says About Russian Contacts appeared first on FactCheck.org. An old meme from Ben Carson’s days as a Republican candidate for president is circulating again. But there’s still no evidence that he said, "My mother raised me with no help from the government." The post Phony Ben Carson Quote About Public Assistance appeared first on FactCheck.org.